Walking up to the interactive data desk for one of five Scion models, you are instantly in touch with correlating information, art, wallpapers and imagery, some downloadable with a Bump of your smartphone. Cyber-socialistas can also follow Scion Instagram and Twitter activity at NAIAS via a live media feed on a large LED video display. If you encounter such an ambient environment next week, surrounded by elevated video walls and 10 different compact and youth oriented vehicles, you have stumbled upon the Scion exhibit at the North American International Auto Show. Put another way, you have arrived in Scion nirvana. The Scion FR-S is the brand’s compact rear-wheel drive sports model, which made its North American debut in Detroit last January, only to be greeted with rave reviews and robust sales, not to mention numerous international awards and accolades. In fact, AutoGuide.com portrayed the performance of the FR-S as “driving bliss,” citing the car’s agility and balance, as well as its responsiveness. It was identified in Torque News recently as the fastest moving vehicle in the US, on average lolling about a dealer’s lot a short – don’t blink – two weeks. The exhibit was designed and constructed by Michigan-based George P. Johnson and may very well be the highlight of the auto show for many attendees. It certainly would be for a few folks we know! 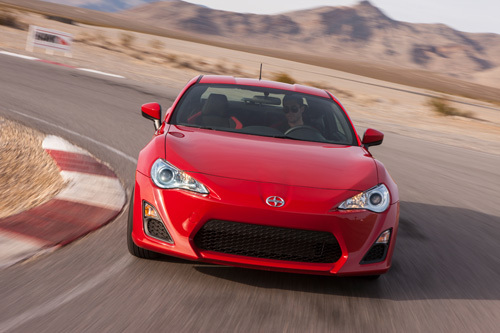 Why Buy the Scion tC over the Scion FRS? Here’s another Scion FR-S/Subaru BRZ you won’t ever see in the U.S.